Note: Shannon Morris taught Spanish and French at Harding High School for twenty nine years before retiring in 2013. He told me the following story in September 2013 as we sat at the picnic table out behind the Harding Home, where he has worked for more than 20 years. “Most people who hear this story are surprised at how well I remember the details. But I have hyperthymesia, which is a kind of extreme biographical memory. So even though the story I’m about to tell you happened when I was only 6 years old, I remember many of the details clearly. “Now this is going to get weird. It was December 10th, 1964, which was a Thursday. I was watching an episode of The Flintstones with my grandmother, who was babysitting me. My grandmother lived with us and had so since before I was even born. She was kind of like a second mother to me. We lived at 634 Lee Street. “So my parents and my brother had gone Christmas shopping that night. I remember The Flintstones came on TV at seven thirty, so it had to have been dark. The house was already decorated for Christmas, quite elaborately. I had a little rocket launcher that I was playing with. I shot the rocket off, and it went up and knocked down some Christmas decorations. We laughed. You know, she was just entertaining me while my parents were gone. “It probably wasn’t more that five or ten minutes before we heard another noise that sounded like squealing tires. And when I ran to the door to see, I remember my grandmother saying, “Don’t open the door!” But I opened the door. Well, those footprints were still there, but they were overlaid with footprints that looked as if they had been made by someone who wasn’t wearing shoes. And I remember very distinctly finding that strange. I remember my grandmother yelling, “Close the door and close it now!” And she grabbed me and pulled me back from the door before closing it. Once that happened, that’s when, excuse the expression, all hell broke loose. My memories from that point on are very, very clear but also bizarre. “Our TV was an old black and white Philco with the dials on the top. And it stood on legs – it wasn’t a floor model. And I can still see the pictures that my mom had sitting on top of that TV. In any case, for some reason I looked underneath the TV. They had it sitting in the corner of the room. And I remember looking under the TV, and I saw what looked like dog’s legs. But we didn’t have a dog. They were grey and I only saw two. I remember screaming because I didn’t know what that was. At that moment I didn’t know where my grandmother was. I have no memory of that, which is strange for me. I only remember seeing those two animal legs. And they moved. From somewhere out of my field of vision, I heard my grandmother tell me to hide. And I hid behind the couch. There was a space behind the couch, and just above the back of the couch was a window. I distinctly remember hiding, but I didn’t know why I was hiding. I never did find out why I was hiding. And at that point I still didn’t now where my grandmother was. “I was sitting there with my back to the window when I heard a noise above me. The curtains were open. 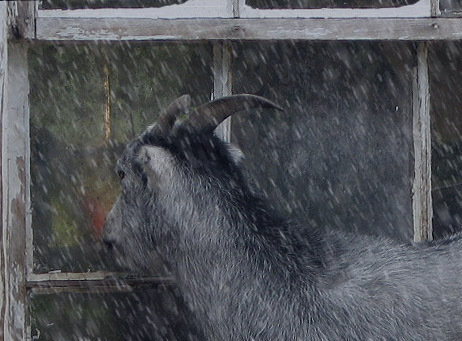 I looked up over my shoulder and at the window, and there was a goat looking in and staring directly down at me. That’s all I can remember – a gray colored goat – at the window! Now I’m not saying it was the devil or anything of the sort. It looked like a barnyard variety goat! I remember screaming, but that’s the last I remember. “The next thing I remember was sitting on that couch crying and shaking, and my grandmother was in the room, but she wasn’t sitting with me. She was standing up, and I remember my mother, my father, and my brother (who was much older that me) coming in with all kinds of Christmas presents. Bags and bags of stuff. And I remember my grandmother telling them, “We have to talk.” And she took them off into another room and left me sitting on that couch right by that same window! Since then, to this day, I always close the window shades wherever I am. “Here’s another strange thing about an already strange story: to this day, I’ve never been able to get anyone in my family to talk to me about what happened that night. My mother is 91 and lives with my sister, who is 73. I was by far the youngest. If I bring it up, mother says, “There are things better left unsaid.” I’ve asked and asked, but she won’t talk about it. My grandmother, who died when I was 21, wouldn’t discuss it, either. I would try to get her to talk about it, and she’d only say, “Now, now, don’t worry about it.” And my brother claims he doesn’t remember it. “Even all of these years later, I have so many unanswered questions. Was it paranormal? It sure seemed like it at the time. But other possibilities have also occurred to me as well. Maybe it was a home invasion. Maybe someone was trying to break in, and that’s why my grandmother told me to hide. I was talking to an acquaintance one time, and he said that maybe these strange memories I have of that night are replacement memories for some traumatic event. But what a heck of a way to deal with it! Because that memory has caused me a lot of long-term stress. Another possible explanation – at least in my mind – had to do with a rumor going around town about a man named Mr. McGregor. My brother, who would’ve been in his late teens then, had some friends over a day or two after that incident, and I remember there were a lot of hushed conversations about a Mr. McGregor out in the county and his having seen something on his property that no one could explain. (I remember the name because Peter Rabbit who was always getting into Mr. McGregor’s carrot patch.) What this man had supposedly seen was never clear to me since these conversations always died out when I went into the room. 1. I think the reason that I looked under the tv is that that must have been the first place I thought of to hide after my grandmother told me to run and hide. And I think seeing the 2 dog legs (which looked very mangy and nasty, by the way) scared me just as much as later seeing the goat! And why only the hind legs of a dog? Where was the rest of that dog?!? 2. I can’t get my head around this question: Where was my grandmother while I was looking for a place to hide? She was always a very loving and protective grandmother. If there was such a danger that she wanted me to run and hide, why didn’t she grab me up and take me out of harm’s way? Why didn’t she hide with me? Where the heck was she and why did she leave me alone to hide?? 3. What did the goat do after I saw it? And where was I between the time I saw the goat and when I “came to my senses” on the couch later? Did I pass out from fear of that scary – looking goat while I was behind the couch?